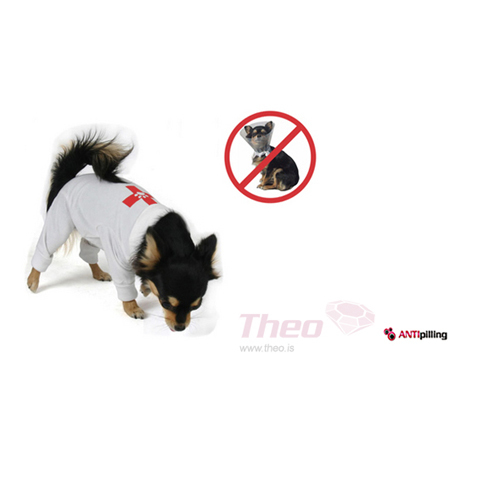 The Owow overall is especially designed to use instead of the protective cone used after dogs and cats have an operation. The overall protects the area by restricting the animal from reaching it. The overall is made from white cotton that is elastic and maintains good airflow in and out allowing the area to heal faster and with less chance of an infection. Another benefit from the use of these overalls compared to the traditional protective cone is that the animals are very often afraid of the cone and have problems with eating or drinking with them on. This can lead to slower healing but this problem is eliminated with the Owow overall. Owow overalls come in seven sizes. 4XL 53.cm./20,7" - 57.cm./22,6" 47.cm./18,4" - 50.cm./19,8" 79.cm./31" - 88.cm./34,8"
5XL 58.cm./22,7" - 62.cm./24,4" 51.cm./19,9" - 54.cm./21,3" 89.cm./34,9" - 98.cm./38,7"